...And I hope IDS is offered a job. He has a lot to offer the party and the country. I would be grateful if the Editor, as a close associate of IDS, could tell us what he thinks of Mr Cameron's support for drug liberalisation. Jolly good. I assume this means IDS approves of social entrepreneurship schemes etc. The CSJ covers a crucial area of policy so I find it reassuring that IDS believes Cameron can deliver. John Reeks - DC has always been very clear that he will be relying on the support and advice of more experienced colleagues. It's good to know that he can count on IDS. IDS 4 Shadow Home Secretary, failing that ID or Defence. Sorry, I'm going to spoil the party folks, but... well well, all the Right Wingers rushing to smother Cameron with praise now he is a dead cert. There is a bit of unashamed opportunism going on here. I'd be surprised if Cameron can get a word in edge-ways once he's elected you know. IDS would have more respect from me if his 'exclusive' was slightly more candid, instead of releasing this mountain of squidgy guff on us at the last minute. Yawn. This is IDS, The Tory Party's own MR Cellophane I will have you know. It would appear Oberon, that the quiet man has turned up the volume. Oberon, I think the fact that so many senior figures from all wings of the Party have publically backed Cameron - whatever their motives - means that (assuming a DC victory) we have an excellent chance of party unity and strength leading into the next election. I am impressed. An exclusive from IDS; this site just gets better and better. I wonder what would happen if David Davis actually won? He would have less than half of the Parliamentary support in the Conservative party. A dangerous position to be in I would have said, as Mr Duncan Smith unfortunately found out. well well, all the Right Wingers rushing to smother Cameron with praise now he is a dead cert - says Oberon. Don't agree with that Obe. What was so striking about the so-called Right-wingers is that so many voted for Cameron and not Fox, who you would have imagined to be the eurosceptic's choice. They said Cameron would pull Ken Clarke's backers, but he instead chalked up a batch of eurosceptics, new localists and so on, and David Davis did the deal on keeping the EPP for two more years to get the Clarke boys into his tent. 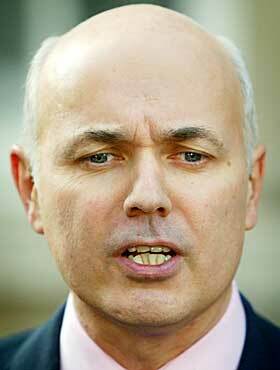 I would give IDS the benefit of your doubt. If he says the voluntary organisations are impressed with Cameron, then I would believe them, and I would also give credit to IDS for representing their views here. Despite my outburst about Shadow Home Sec etc, which was basically showing my full support for him, I think the consensus with most people is that his agenda is a good one and that should be reflected in a relevant ministerial role - he would arguably have more influence in a 'lesser role' so that he is both effective in his portfolio and able to work with CSJ etc. Anyone who doubted David Cameron't right-wing credentials should be satisfied with the endorsement of Mr Duncan Smith. Mr Cameron has support right across the ideological spectrum of the party. I still have this fear in the back of my mind that Mr Cameron will start changing too much - but I am willing to take the chance. If Mr Cameron succeeds the benefits for the party and the country will be enormous. Still no word from the Ed on IDS's views on Cameron's drugs views. The silence is deafening. Is our Ed at odds with his CSJ colleague? I think we should be told! Come on Tim! Selsdon Man, just because you and I may today have the luxury of time to check the same thing within just over an hour doesn't mean that the Editor does! Good on you IDS. You have backed a winner. If "anyone can Cameron can" unite the Party. I do hope that all members of the Parlamentary Party will get behind DC. There has been enough back stabbing in the Party during the past few years and as you all know it has cost us dearly in votes.This type of behaviour has got to stop now. I am teasing Tim, Samuel. The Quiet Man was quiet on drugs, a major issue discussed at Davis's speech to the CSJ. Wasn't this obvious? Cameron has shown that on many things he is at least as right wing as Davis and we've known that IDS doesn't like or particularly rate Davis (taking after John Major in that respect). "Sorry, I'm going to spoil the party folks, but... well well, all the Right Wingers rushing to smother Cameron with praise now he is a dead cert. There is a bit of unashamed opportunism going on here"
Don't underestimate how difficult Hague and Fox and IDS have found working with Davis. ..in order to secure membership of the UN. It's not like Cameron isn't sensible enough to appoint big guns from different wings anyway. This is a positive thing, we have a pretty figurehead with a strong cabinet around him. "Anyone who doubted David Cameron't right-wing credentials should be satisfied with the endorsement of Mr Duncan Smith. Mr Cameron has support right across the ideological spectrum of the party"
These two comments contradict each other. IDS is a little man who wants a job. Never overlook the obvious. Er, what does this mean? "There must be no more noises off and personal briefings that have poisoned our party for too long." "This leadership race has been good for the Conservative Party. It has been conducted with civility and humour." I can only assume he hasn't been reading some of the posts on here.